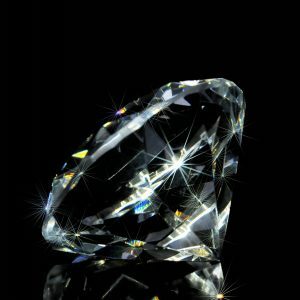 Don’t lose your diamonds and gemstones! It’s that time of year again. It’s time to start your New Year’s resolutions and make goals for the year. It’s also time to get you stones checked. Many people forget to do this and pay the high price of losing their diamond or gemstones due to worn prongs or other ring mounting failures. This is easily avoided by having your jewelry checked and cleaned at least 3 to 4 times a year. Most jewelry stores are happy to clean and check your rings, pendants and earrings for free and you are only charged if there is a problem. Usually the cost of a stone tightening is small compared to the cost of replacing a stone. Stop into your local jewelry store and have those beautiful pieces of jewelry checked out. 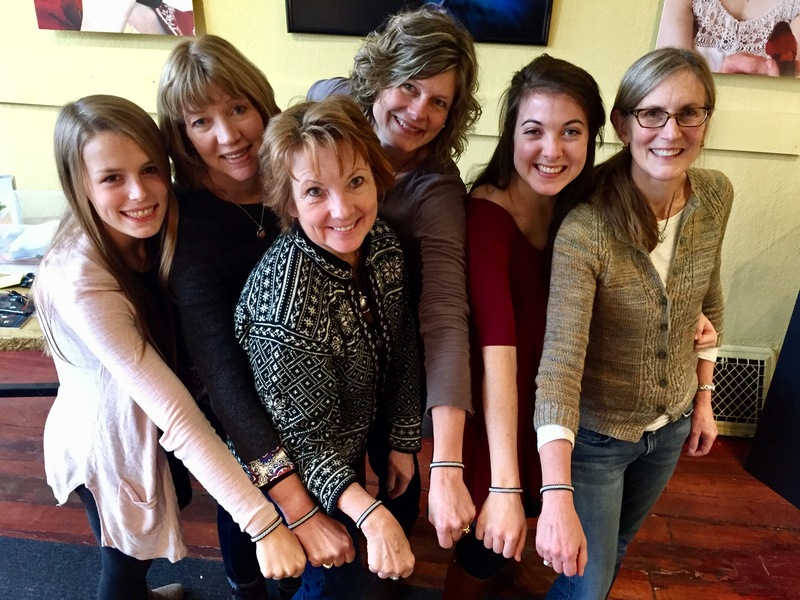 If you are near us in Lanesboro, Minnesota stop into Crown Trout Jewelers and we’ll be happy to help you out. All of our repairs are done in our own shop! Looking to get a jump start on that New Year’s resolution to learn something new? Join us for a Saami Inspired Mixed Level Bracelet Class! 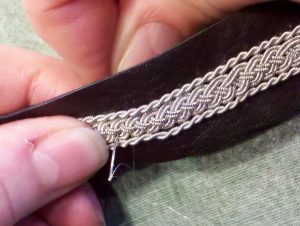 Beginning students will explore triple braiding coiled pewter wire and sewing the finished braid to a softened reindeer hide strip. 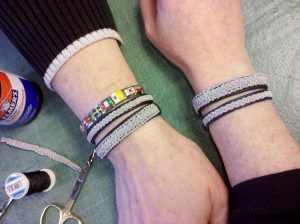 Advanced students will complete a multiple braided bracelet on a wider reindeer hide strip. 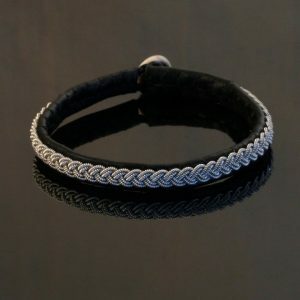 Reindeer antler buttons finish off these beautiful bracelets. Cost: $40 per student (due upon registration) plus a materials fee paid directly to the instructor the day of class. Call: 800-279-9333 to register or visit www.ingebretsens.com/classes/crafts for more information. What is happening in Lanesboro Minnesota? A traveling exhibition & community engagement initiative of the Smithsonian’s Museum on Main Street program that explores the centrality of water in our lives. Join us in Lanesboro for Water/Ways January 7th through February 19th! In Minnesota, water is a part of our identity, our culture, and our history. Water/Ways, a new and exciting exhibition and community engagement initiative from the Smithsonian Institution’s ‘Museum on Main Street’ (MoMS) program in partnership with the Minnesota Humanities Center, will be on display in the Events Hall at Commonweal Theatre in Lanesboro Wednesdays through Sundays 10 a.m. to 4 p.m. during the six week run. Admission is free. The exhibition and overall initiative is designed to reconnect Minnesotans to our water and the need to become more actively involved in its protection by using, in addition to science, the tools of story, history, faith, ethics, and the arts. Lanesboro is one of 6 small towns and Minnesota is one of the 5 initial states selected by the Smithsonian to participate in this new traveling exhibition. Water/Ways reveals the central nature of water on our lives by exploring how Americans use water, how water unites communities, how water affects every element of life, and how Americans care for our water and protect this valuable resource for the future. Water/Ways aligns perfectly with the Lanesboro community’s values for preservation and celebration of our natural landscape, and the collaborative nature of the project is a good fit for what diverse sectors of the community are already doing to provide unique cultural experiences in a small town. 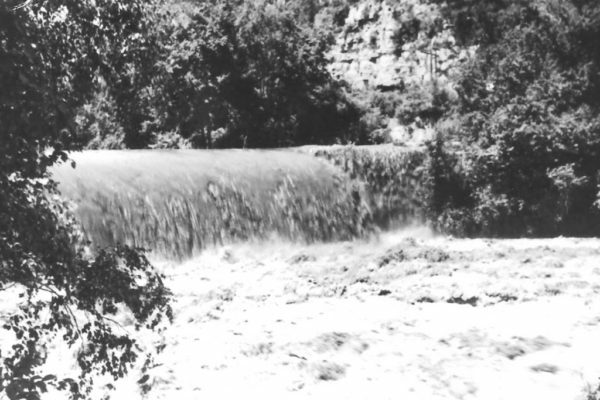 Lanesboro is also a destination for outdoor recreation and has one of the most unique historic dams in the nation. Lanesboro Arts, Commonweal Theatre Company, Eagle Bluff Environmental Learning Center, Lanesboro Museum, and Friends of the Root River have partnered together to develop and present several dynamic local programs and engagement initiatives that will help bring together the storyline of the Root River Watershed. We Are Water MN is an interactive story collecting exhibit that focuses on individuals’ relationships with and responsibilities to water. The exhibit includes stories from people reflecting on the meaning and experience of water in Minnesota, stories from local people in the Root River Watershed, and space for exhibit visitors to add their own stories and images. We Are Water MN also raises awareness about the quantity and quality of Minnesota’s water, connecting exhibit-goers to active water solutions. The exhibit was developed by the Minnesota Humanities Center, Minnesota Pollution Control Agency, the Minnesota Department of Health, and other statewide partners. The exhibit will be on display alongside Water/Ways in the Events Hall of Commonweal Theatre Wednesdays through Sundays 10 a.m. to 4 p.m. through February 19. Currents of Change is a companion art exhibit at Lanesboro Arts Gallery that pairs historical water photos of Lanesboro with mixed media artworks interpreting those photos by 15 regional artists. The historical photos featured in Currents of Change were selected and provided by the staff and board of the Lanesboro Museum. The selected photos showcases Lanesboro’s deep relationship with water over time and includes winter scenes, floods, fishing, the river, dam, ponds, blizzards, and more. The exhibit will be on display in the gallery through March 5 and will open with an artist reception on January 7th from 4 p.m. to 6 p.m. that will feature a Water Bar. Additional programs and exhibits are scheduled throughout Lanesboro January 7 through February 19! For questions on volunteering, being a docent, or bringing school groups contact Lissie Harter at Eagle Bluff: volunteer@eagle-bluff.org. For information on attending the plays at Commonweal or questions related to viewing Water/Ways and We Are Water MN, contact their box office at 1-800-657-7025 or visit CommonwealTheatre.org. For all other questions, please contact Adam at Lanesboro Arts: adam@lanesboroarts.org or 507-467-2446. 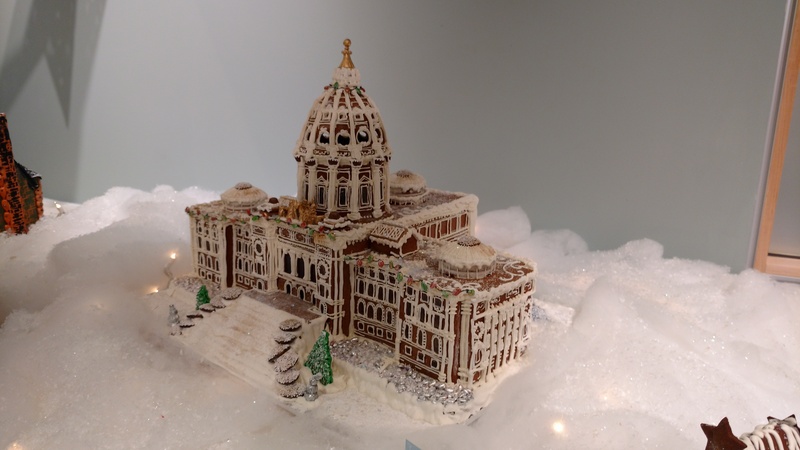 These are the best gingerbread houses I have ever seen! 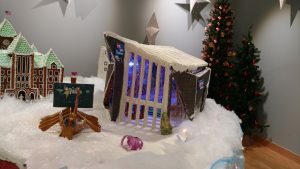 I walked into the Norway House gallery and the room was filled with amazing gingerbread houses. If you had asked me before this show to describe what I thought a gingerbread house was I would have probably described graham crackers glued together with cake icing. How wrong I would have been. Enjoy! 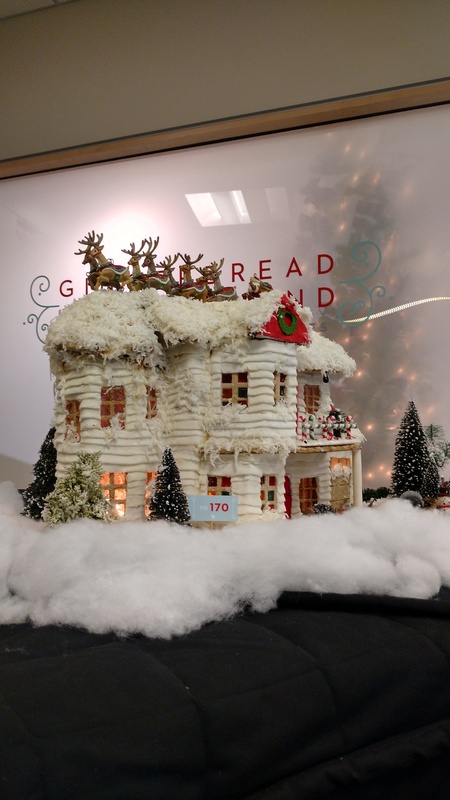 The Norway House in south Minneapolis, MN had their second annual Gingerbread Wonderland show this December. 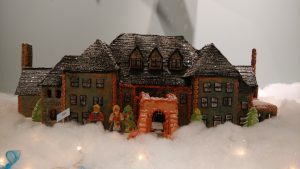 These grand houses were made by local bakers and artists and included submissions from children. The houses represent land marks in Minneapolis and St. Paul. I was making a couple of custom sterling silver rings and took a short video of the annealing process. 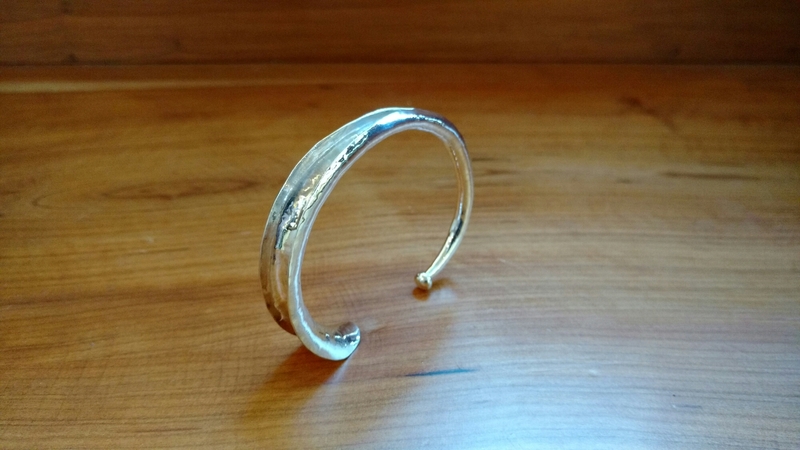 The sterling silver had been worked into its basic shape and had become rigid and hard to bend. When this happens it is time to anneal the metal. This process will make the metal soft and allow it to bend easily. 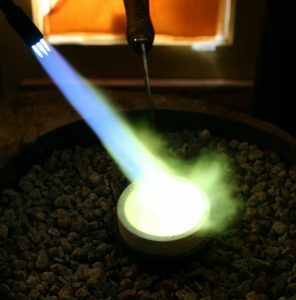 The metal is heated to around 1050 degrees and 1150 degress with a torch. The metal is then quenched in water and cleaned in soapy water or an acid bath. After annealing, the metal is ready to be shaped into a round band. If you like the video share it with a friend! This is a great example of a custom designed ring using a found stone. This is a “green stone” often found on Isle Royale. The clients wanted something celebrating their love and memories from their time spent on the island. Working with their personal story I created this unique design. 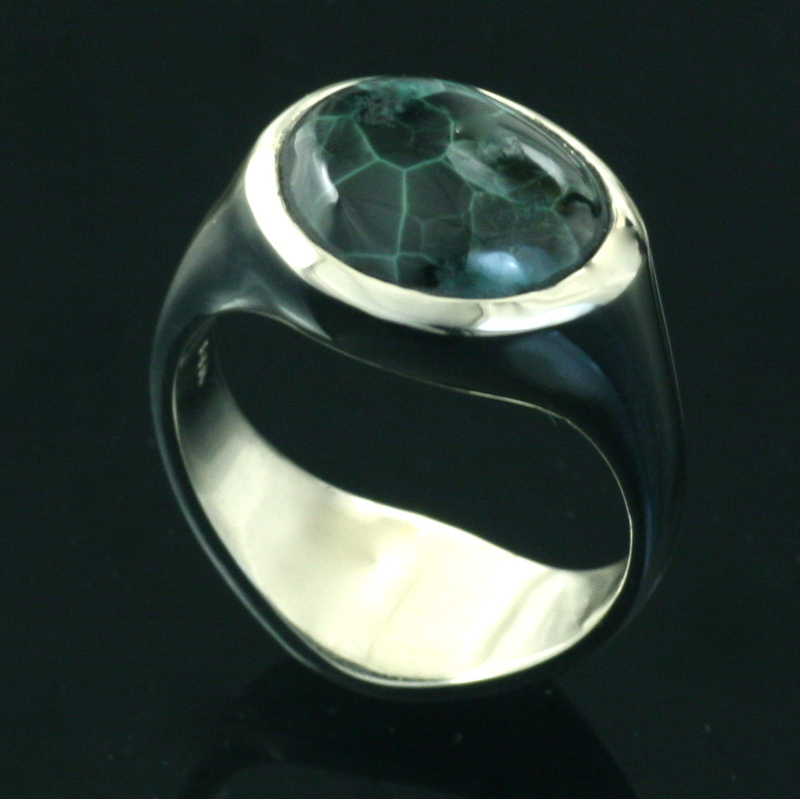 The green stone was hand cut to a particular size and shape and set in a custom hand carved 14k white gold mounting. 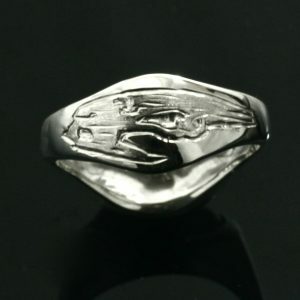 On the back of the ring shank I engraved an aerial view of the island. I loved working on this! Thanks Liz for doing some awesome renderings to represent the island!